The 100% polyester material accounts for the high durability of the Clique Ladies' Fairfax Lady and also for its wrinkle-free attribute. The Clique Ladies' Plus Size Marion is a classic pique knit polo which is perfect for everyday use. 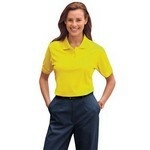 This custom logo women's 100% polyester pique polo shirt features BLU-X-DRI protection. Our customized women's 3/4 sleeve poplin shirt is stain, wrinkle and crease resistant. The personalized women's 3/4 sleeve V-neck t-shirt features superfine 6.5 ounce 1X1 rib knit. The Women's CB DryTec™ Championship Polo is a combination of unbeatable softness and durability due to its fabric of 65% cotton and 35% polyester. The Ladies' CB DryTec™ Genre Polo is specifically designed with 100% polyester to resist water and stains and avoid any wrinkles. Our promotional women's long sleeve button cardigan sweater features superfine 6.5 ounce 1X1 rib knit. This custom logo women's long sleeve premium denim shirt is sandwashed for extra softness and shrinkage control. Our customized women's long sleeve Teflon treated twill shirt features a wrinkle resistant soft touch finish. Our Ladies' Plus L/S Epic Easy Care Fine Twill features attractive colors and Princess seams, customizable with your company logo. 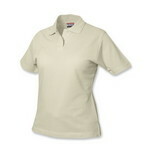 This custom logo women's poplin camp shirt is stain, wrinkle and crease resistant.